An interview with Amy Hughes, mother of Olympic Gold Medalist Sarah Hughes and Olympian Emily Hughes. 50 minutes, 27 seconds. On her most embarrassing skating moment: I was going through chemotherapy for breast cancer, so I didn’t have any hair, but I had a really terrific wig. And we went to Eastern Sectionals, which were in Simsbury that year, and I wanted to look really good for the competition. So I let this beauty parlor take my wig and do it, you know, make it look good, and they somehow turned it upside down. And it was – you had to see it. And I didn’t have anything else to put on my head. Nobody knew who I was, it was sticking straight out. And we were – I actually thought I’d better go find Sarah, because if she looks and she’s going to see me in the middle of her number, she’s going to start laughing and say “What happened to you?! 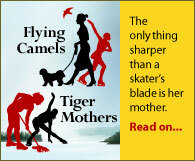 ?” So we had to go find her – I think I was with my mother at that point – and she laughed so hard I didn’t think she was ever going to settle down before she was going to skate. We talked about that wig forever. I said, I’m going to save this, because this just goes to show that there really is other things going on besides skating…I think I still do [have the wig]. It’s in my closet somewhere. It’s a reminder of things we go through in life. On raising six very accomplished children: Having a big family, I think just makes it better, because nobody’s ever the focus of anything. You’re just part of a whole team, and everybody helps out everybody else, and we all try to support everyone. And I’ll tell you, Emily supported Sarah at the ’02 Olympics, and Sarah supported Emily at the ’06 Olympics. We have these great pictures of each of them holding up signs when the other one skated at the Olympics, which I think just says it all. 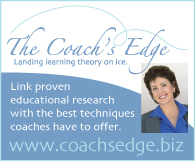 On knowing what she was getting into as a parent of skaters: You know the word ‘clueless’? [laughs] I was very naïve. I really was. I had no idea. I don’t know if that’s good or bad [laughs], but I really didn’t know. I thought it was just normal, what they were doing. And I guess…a lot of parents have said, “What did you do, how did you do it?” And you know, I say, every child is different, you never know. If they want to do it, they’re going to do it, whether it’s ice skating, tennis, playing a musical instrument, studying and becoming a math wizard or a chess wizard. Everybody’s different, and if they want to do it, my job is just to give them the opportunity, and get them to the lessons or make it available to them – but not to go overboard, and have them try to do other things as well, which I thought was really important. They all were in public school, and you had to do your homework and you had to meet with your teachers if you were going to be away, to get the work if you were going to have to go somewhere for a competition. They were very responsible. On skating as fun: I always said, if you have fun, you keep doing it. And sometimes – I’ve watched a lot over the years, and seen a lot of things…and I’ve seen so many times when it’s not fun. But I think that’s true across the board of any endeavor. Sometimes families go overboard on anything. I always tried to back off. And I have so many diversions in my life that it’s not hard, you know, sometimes I’ll say, “I can’t get you there so you’re not going”. And I think that’s why the kids have really had fun with it. Like Emily would have to get up and be dressed and get everything together because I couldn’t get everything together. They do a lot on their own, they plan a lot on their own, they make their own appointments a lot of the time. On choosing coaches: I always say that you should find a good coach for your child, because you know what? It’s possible for a coach to be good for one kid, and not for another. You know, like anything else? And you just want to find something that just seems to click. I mean, can you imagine, 13 years with the same coach? And it’s okay. The best thing is, all my children like Bonni [Retzkin, Emily’s coach]. And that’s a hard thing, when you have six children and they all like the same coach. But it’s because she’s a good person, and I think that’s what’s really been important. On watching her children compete: Oh, I’m a nervous wreck [laughs]. No question. And he [her husband John] never sits still. If I sit with him, he’d kill me from squeezing. I couldn’t [watch Sarah’s long program at the Olympics]. I stood right outside the door, and I gave somebody my ticket…I’ll tell you why I couldn’t watch it. I had gone to all her practices, and her practices were fabulous, and I thought “Wow”. And she just seemed so happy. And I thought, “Everybody’s going to be watching her, my husband’s watching her, I know she can do it, and if she doesn’t do it, I’m going to have a heart attack” [laughs]. Not for me, but for her. She can do it. If she was not doing so well, I would say, oh, well, whatever, but I was so nervous I couldn’t believe it. And I did the same thing with Emily. Emily was having good practices, and I said, “I don’t think I can watch this”. And I watched them practice all those years, I took them to the rinky-dink places, dropped them off and watched them walk in, and when it came to that, I couldn’t watch. And people said, “How can you not watch?” And I said, “I’ll watch it after. They don’t know. I’m not right on top of them. Enough people are watching.” At the other competitions I’ve gone to, if nobody is around or nobody’s there, I have to watch because I have to tell my husband what happened. But when he’s there I don’t have that responsibility [laughs]. About working with charities: I think another nice thing about skating is the charity events that my children have had the opportunity to be involved with. Both Sarah and Emily, they’ve visited a lot of children in hospital, they can relate because of [my illness], and nothing really bothers them, they’ve seen so much stuff. And they’re wonderful about it. It makes the kids feel good, and the parents. We were at St. Jude’s in Memphis, and this little girl Hannah had a port on her chest, and she had a doll that had a port. She said, “See, my doll has the port because I have one.” And my daughter said, “Oh, that’s nothing. My mother had two of them.” And the little girl said, “Your mother had two?” [laughs] And I said, “Yeah, I had two.” And Hannah’s mother came over to me and said, “Did you really have two?” And I said, “I did! I had two and everybody saw them” [laughs]. And you know what? That mother, she wrote me a note, and sent a picture, we have a picture, and said, “Hannah couldn’t get over it”, and suddenly Hannah wasn’t so sick because I had it worse. And those are the kind of things that put everything in perspective. And the kids, I said to them, “You made this family feel good”…and it’s all from the skating.